Nasturtiums come in varieties ranging from trailing to upright and in brilliant sunset colours with peppery flavours. 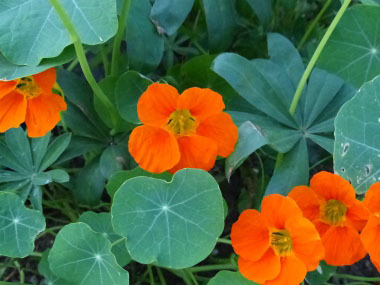 Nasturtiums rank among one of the most common edible flowers. Blossoms have a sweet, spicy flavor similar to watercress. Leaves also add peppery tang to salads. Pickled seed pods are a less expensive substitute for capers (seeds taste hotter than the flowers and leaves). Use entire flowers to garnish platters, salads, open-faced sandwiches, and savory appetizers. 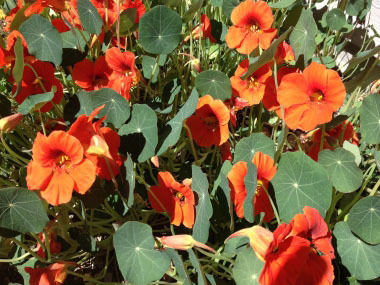 Fields of Nutrition has medicinal benefits and vitamin/mineral content of Nasturtium. Colours: These flowers can be yellow or orange. Height: 15cm to 1m (6" to 3'). 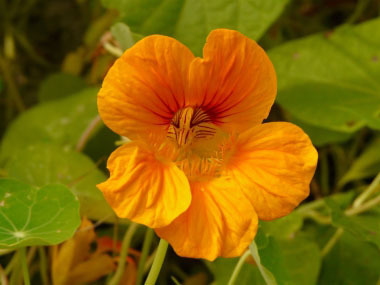 Medicinal qualities: Nasturtiums have long been used in Andean herbal medicine as a disinfectant and wound-healing herb, and as an expectorant to relieve chest conditions. All parts of the plant appear to be antibiotic and an infusion of the leaves can be used to increase resistance to bacterial infections and to clear nasal and bronchial catarrh. Leaves are antibacterial, antifungal, antiseptic, aperient, depurative, diuretic, emmenagogue, expectorant, laxative and a stimulant. Externally it makes an effective antiseptic wash and is used in the treatment of baldness, minor injuries and skin eruptions. It appears that extracts from the plant have anticancer activity. 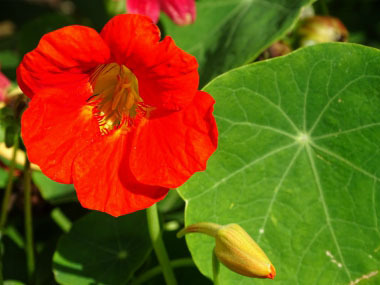 Dye: Nasturtium flowers simmered down to a luminous red dye which made salmon coloured fabric.